From the Initial Idea to Action! Formation of ICON was a necessity. Right after the Iranian community was faced with the first executive order in January 2017, the strong need for the Iranian community to come together and support each other became inevitable. The original idea of ICON was formed in response to this necessity. Creating new solutions for the issues of the Iranian community does not depend on which political group is in power. Discriminatory behaviors and unfair treatments against the Iranian community in the US have been a continuous practice in the last 30 years. It accelerates at times with hardline policies and dilutes on other occasions when moderates are in power, and it continuously impacts our daily lives in different manners. In this context, creating a peaceful and tolerable space for our small and vulnerable community is a necessity which requires each of its members’ engagement. ICON’s meeting at the Alwan Foundation in Manhattan was the first response of the New York-based Iranian community to this necessity. 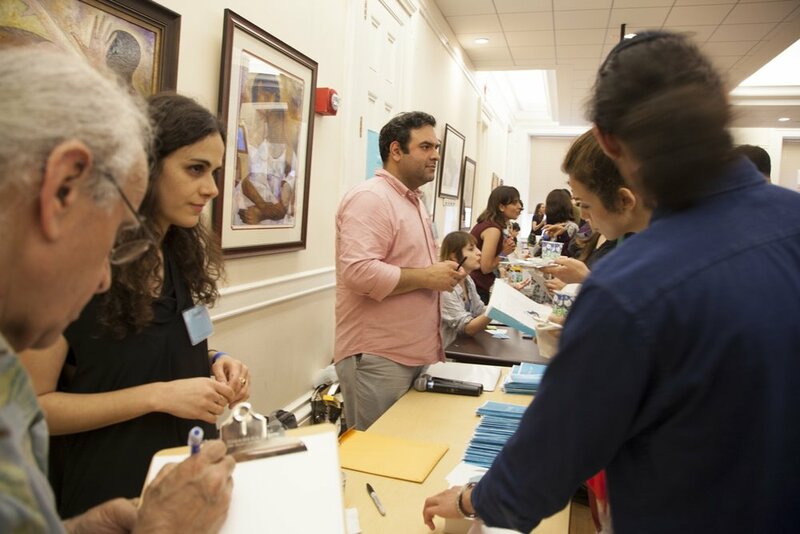 At this gathering, which was held only days after the executive order was issued, more than two hundred Iranian and Iranian-Americans participated in a friendly and informal conversation and discussed ICON’s structure and next steps. The outcome of the meeting of Alwan and its subsequent meetings were summarized in a simple but crucial goal: as Iranians who live in the US, we need to rely on our strong collective identity to support one another to pursue our rights. After the first meeting, the core team of the volunteers took on general planning tasks. Volunteers suggested a collaborative project with New York City to engage the Iranian community with the city and introduce the City’s services to them. Mohsen Namjoo and Yahya Alkhansa, two of well-known Iranian musicians of New York, and volunteers for ICON, offered to perform at the event. The idea of he event was presented to New York City as “A City for Us All” and was strongly welcomed. Volunteers immediately started working on organizing the event and inviting all the members. Preparation, planning, and implementing ICON activities are products of the long-term work of a group of volunteers. Over two month of intensive work, planning, inviting various groups of the Iranian community, continuous communication and coordination with the City, and designing and producing cultural and promotional materials were among the activities undertaken by the volunteers during the weeks leading up to the event. The volunteers passionately devoted their time and energy to make sure ICON becomes a reality. In addition, the costs of “A City for Us All” were covered by individuals from within the Iranian community. We specifically want to thank SOFREH Persian Restaurant and Print Icon NYC for generously supporting this event. On June 17, 2017, over 650 Iranians and non-Iranians from the New York Metro Area gathered at Brooklyn Borough Hall. The event opened with Sadra Shahab welcoming everyone on behalf of the ICON and volunteers. He then briefly spoke about how ICON started off and how “A City for Us, All” became possible. After his short introduction, Sarah Saeed from the NYC Mayor’s Community Affairs Unit read Mayor Bill de Blasio’s letter to ICON, in which he invited Iranian New Yorkers to participate in public issues of the city actively. Brad Lander, New York City Council Member representing Brooklyn’s 39th District, was the second speaker, who highlighted the collective capacities of the Iranian community that led to “A City for Us, All.” He mentioned his personal experience with various community groups and the critical roles that they play in New York City’s decision-making. Hanif Yazdi from the Mayor’s Office for Immigrant Affairs, and also an ICON volunteer, spoke about the various services the City offers to immigrant communities and invited everyone to take advantage of them. The last speaker was Gagandeep Kaur from NYC Health Services who introduced “Thrive NYC,” which is the City’s relatively new initiative that offers mental health services to all New Yorkers. After a short break, Mohsen Namjoo and Yahya Alkhansa performed for about an hour. At the beginning of their performance, Mohsen Namjoo spoke briefly about the necessities of these kinds of gatherings and emphasized the efforts of the volunteers in the several weeks that led to this successful event. He invited everyone to participate actively and efficiently in building a better future. Do we, as Iranian New Yorkers, have a sense of belonging to this city? Can we call this city our home? Some of us may still be aliens in the city despite many years of living in New York. For others, social life is limited to relationships within small circles of friends. Some of us may have found a way to belong to our living environment by interacting with people from other nationalities and participating in various artistic, cultural and political activities. But, whatever our personal tolerance is, we as one immigrant minority group do not have common experiences that attach us to the city. Most of us do not view ourselves as members of a minority group, and do not know about other Iranians who might deal with similar issues as us. Since we do not have a real community to open up our concerns and desires to, we are less able to integrate those demands coherently and thoughtfully. The departure point of any social change is the advancement of public demands. Where those demands are raised is within a group of citizens who together define their collective concerns and interests, and bring them onto the public agenda. Demanding from the city is only possible through a coherent and active community. As the population of Iranians in New York grows, it is the that we, like many other immigrant communities, build our community together, and expand our sense of belonging to our city more deeply. Experience shows that feeling of belonging relates to mental health, quality of individual life, and sense of security directly. The more clear the collective voice of an immigrant group, the more stable their position will be in their society, and the happier they live alongside others. We need to thank each and every volunteer who helped us make this event happen. In addition, we warmly thank all the organizations, agencies, and groups that participated in A City for Us, All.